Set in the beautiful Faithlegg Estate, Paddy Merrigan's excellent layout was officially opened in 1993. Though not especially long, the challenge at Faithlegg is to negotiate the strategically positioned bunkers, and the tricky undulations on the putting surfaces. The greens are renowned as some of the best in the South-East, and the expertise of the designer in utilising the existing features of the land ensures that the course's maturity belies its relative youth. The magnificent surroundings and the pristine condition of the golf course itself make Faithlegg an absolute joy to play. The charm of the hotel at Faithlegg is in the perfect combination of period character and modern comfort. The entrance hall is dominated by an incredible chandelier, designed specially by the renowned Waterford Crystal company. The hotel's original charm has been embellished by the recent addition of a new wing, which houses 66 en-suite bedrooms and facilities for conferences. These are the ideal complement to the 14 bedrooms in the old house, and ensure that visitors have access to all the amenities to be expected in a 4-star venue. 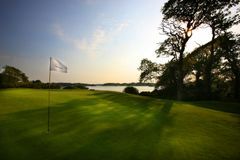 The Estuary Club is Faithlegg's superb leisure, health and beauty complex. Guests can take advantage of the huge Jacuzzi, swimming pool, steam room and gymnasium. A gourmet menu is available in the Roseville Rooms, set across three ornately decorated rooms. The Piano Bar offers great views across the gardens, whilst enjoying a spectacular cocktail.